Enjoy the comfort of this 'forest friendly' portable gas campfire. Whether you're out on the road in the RV, car camping with the family or just enjoying a night out on the patio this portable gas fire pit is sure to keep you warm. Comes with base and high pressure burner, lava rock, two roasting sticks, and a carry bag. Gather around the campfire without worrying about smoke or having wood. Great for all types of activities. Tank sold separately. Camp Chef gas fire pits are allowed for use in most fire ban restrictions, check with the local ranger station before use. Sequoia Propane Fire Pit Enjoy the comfort of this 'forest friendly' portable gas campfire. Whether you're out on the road in the RV, car camping with the family or just enjoying a night out on the patio this portable gas fire pit is sure to keep you warm. Comes with base and high pressure burner, lava rock, two roasting sticks, and a carry bag. Gather around the campfire without worrying about smoke or having wood. Great for all types of activities. Tank sold separately. Camp Chef gas fire pits are allowed for use in most fire ban restrictions, check with the local ranger station before use. Sequoia Propane Fire Pit is rated 5.0 out of 5 by 4. Rated 5 out of 5 by lnd4fun from Great fire feature I bought this and placed it in my patio table that was meant to have a wood fire. I didn't want to mess with the wood ashes and smoke. 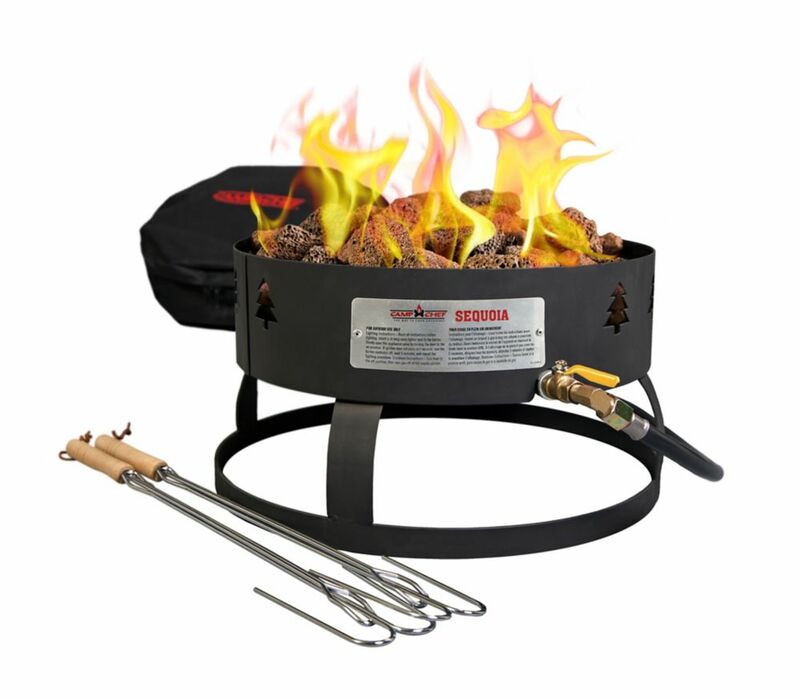 The Sequoia Pit fit perfect and the fire is adjustable and easy to use and light. We have enjoyed many evening sitting out by the fire and my grand kids love the fact we can have s'more's anytime we want. Rated 5 out of 5 by Duxi777 from Perfect I bought this in July 2018 due to the MNR fireban. It was perfect and was used every night for several weeks. I found that opening the propane bottle only 2 turns and turning the fire pit to medium/low would allow for close to 15 hours of use with a 20lb tank! Very happy with this purchase! Rated 5 out of 5 by Ecstatic Momma! from Beyond Expectations This fire pit has went way beyond my expectations! It is one of the smaller pits Camp Chef offers, but I didn't need the bigger ones. WOW! Can I say it produces great flame on it and is so easy to use! This thing even came with roasting sticks! My son and I love to cook our hot dogs over the fire, and also our favorite snack, you named it... the S'more! Awesome Camp Chef! When we need to upgrade, I have my eyes set on your Del Rio! Rated 5 out of 5 by Miss Louise from Good alternative to fire pit. We went camping in the mountains on a day where it was a "No Burn" day, used our fire pit and it was a great experience! Before purchasing the fire pit, I did some research on it, and apparently where it is powered by propane, it is an item you can use while there are restrictions in place on having a "fire" at your campground where it is controlled. It seemed as if we just had regular fire going. Everyone at the campground loved it, and are going to buy one of there own. I am so pleased with this item, it has been a great accessory to have. I used it at home often as well and it's great to just sit by a fire at home, and not smell like "campfire" when I go inside. Great product!